West View Guest House is close to Derwentwater in Keswick and located in the heart of the beautiful English Lake District. Situated close to the Lake, yet only footsteps from the centre of Keswick. West View overlooks Hope Park and is close to the Theatre, boat landings and bus station. We offer three luxury rooms (King Size Beds, Walk in showers with heated floors) and three standard rooms (one on the Ground Floor). 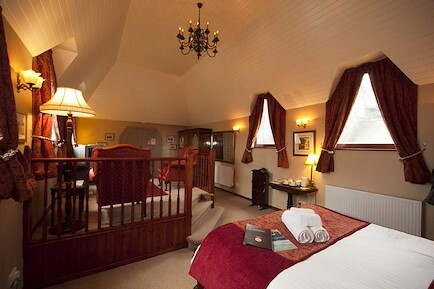 All rooms have en-suite facilities, with colour TV's, and tea/coffee tray. Children welcome; cot / high chair or extra bed (luxury room bookings only). WiFi. The first floor Guest Lounge is open all day and until 11pm. It has the most stunning view across to CatBells and Causey Pike. The room houses an eclectic collection of books plus a display of magic lanterns and pharmaceutical memorabilia. Check out our Adventure page on the West View website for a fantastic variety of outdoor activities that are available during your stay. We are walkers and cyclists ourselves. we can help you with routes and also help you dry out when you return. Our boiler room will dry your kit overnight. We have secure storage for bikes. West View overlooks Hope Park (Pitch and Putt Course) and is 50 yards from the path connecting the town to the Lake. Your enquiry will be sent directly to West View Guest House. Please fill in as much detail as you can.